Playing sport is such a great outlet for me and I’m so glad that I was introduced to it at a young age. Growing up in a wheelchair you can feel like you’re an outsider and alone. I felt this heavily growing up because I couldn’t do the same things as the other kids; I couldn’t play on the playground, run around the school yard, go bike riding, simply go in the sand pit and play the usual running/chasing games that kids play. Being shown to para sport really helped me in my own development. It opened my eyes to see that I’m not alone and that I can connect with others who share the same experiences as me. The basketball is almost bigger than me but I still went out there and played. 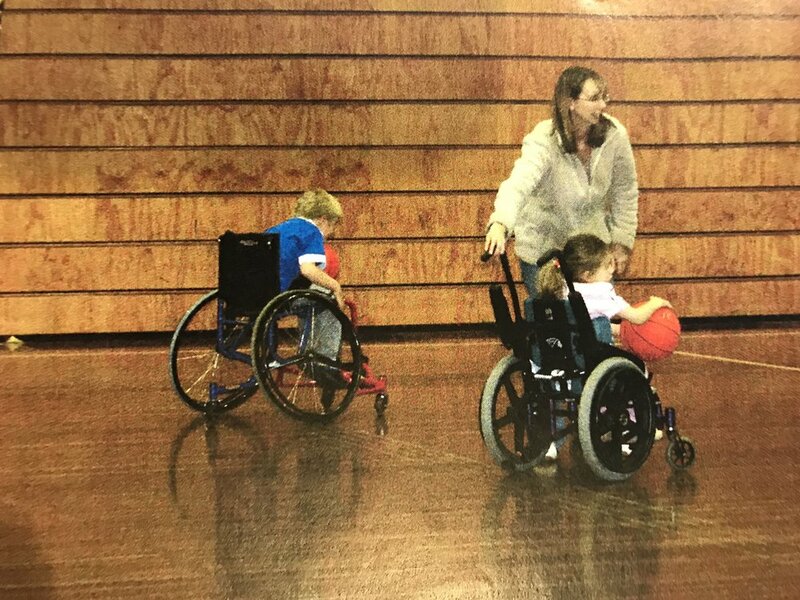 When I was 6 my grade prep teacher introduced me to wheelchair basketball through a local wheelchair basketball clinic that was taking place at a nearby basketball stadium. This was my first ever introduction to wheelchair sport, I had never seen any sport been played and I hadn’t ever seen the Paralympics on the TV. It was quite a new experience for me and I can remember feeling unsure and nervous, especially when we were playing the actual game. I was a small 6 year old girl participating with other kids of all ages trying to get amongst the action. Fast forward to when I was 14 and when my health was finally stable, I officially started to play wheelchair basketball. I would play in a casual basketball team on a Thursday night with many other people with all different disabilities and of all ages. I must’ve looked so out of place because I was teenage girl in a team with quite large adult men. I did enjoy it though, I enjoyed the interaction with others and the ability to be able keep fit outside of attending the gym. Throughout my time in wheelchair basketball I also was apart of the under 21’s state wheelchair basketball. I was only apart of that team for one year because while I was playing with that team and attending training sessions I started to feel that this wasn’t for me. I started to not turn up to training sessions and when I did I was wanting to go home, I also never trained in my wheelchair basketball chair outside of a training session or game. I was slowly losing interest. My first ever training session. I was freezing but loved it. During this time, I came across a video of a friend of mine (whom I had met throughout basketball) going up and down an athletic track in a racing wheelchair. I instantly had the thought “How do I get into this sport? Could I play this sport?”. I messaged this friend and he gave me the number to the coach who was running training sessions on a Tuesday after. So that next Tuesday I went down to Albert Park and had my very first training session. Even though it was pouring with rain I enjoyed being in the race chair immediately. For me, I love participating in wheelchair athletics because I enjoy being my own competitor and having the luxury to focus on my own skill development. I enjoy not having the pressure of my actions impacting on the team, in wheelchair racing it is just on me. If I don’t train that’s fine but I may face the consequence of not improving or finding it difficult when I go in my race chair the next time. Whereas, in basketball I felt that I was slow and I found it difficult. Wheelchair racing is a great outlet for me for so many things; it helps with me fitness, my mental health and I have the ability to meet so many great people who are from all different walks of like. I use my race chair as a very good tool to keep fit. If I’m wanting wanting to go out on a run like able bodies do, I can hop into my race chair and go for a roll on my rollers or roll up and down a enclosed court. It has really opened my eyes into keeping fit, especially this year. I’m constantly wanting to do a session to improve myself. I have also made so many great connections through wheelchair sport. I had some good friends whom I can train with or I race with a time to time and I feel like it is a small community. I can always go up to someone and ask them for a helping hand or advice. Wheelchair racing has also really helped me with my mental health. Not only does the physical exercise help cleanse the thoughts but it also has allowed me to feel like I’m not an outsider because in wheelchair athletics especially, everybody is uniquely different and even though you may share the same classification as others you have your own time. My time in wheelchair basketball isn’t over yet either. I still have my basketball wheelchair which is being stored. This year when I return from Switzerland I’m going to play in the women’s state team to help with the numbers. I won’t feel pressure this time, this sport will just be for fun. I’ll need to dust off the cobwebs but I’ll get out into the action. I’m glad that my grade prep teach introduced me to the world of wheelchair sport. It has really opened my eyes and helped me to improve myself for the better.